George Graham Reviews Scott Law's "Deliver"
Artistic value in contemporary music is a combination of innovation and musicianship. Sometimes the innovation is there, but if the band can't sing on-key or play their guitars, the result is pretty worthless, However, one can sometimes be amazed at the popularity achieved by incompetent musicians. On the other side of the coin, there are performers who are painstaking accurate in reproducing existing or past pop music. When it comes to recording and releasing such music, what's the point, when the original is always available. Somewhere in between there lies the noteworthy music that is both original and well-played. And there is a continuum between the two poles. The CD we have this week is a worthwhile recording whose point along that line tends more toward the musicianship side, rather than being particularly innovative. But it excels at what it sets out to do, and that is to serve up some infectious rock and funk, with a little roots rock thrown in, which itself makes it a bit innovative. 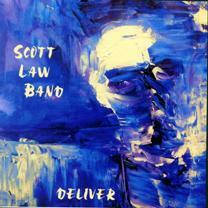 It's the new recording by the Scott Law Band called Deliver. Scott Law is a veteran guitarist from the Pacific Northwest who has often worked as a sideman and has also been involved with a creative acoustic jam band called Hanuman. He also was part of groups called Melting Pot and the Everyman Orchestra. Though he has made a live recording with his own band, this is the first studio release by the ensemble, which includes a tight horn section and retro keyboard sounds like the Hammond B-3 organ and the clavinet. Law and his band emphasize a 1970s-influenced rock and funk sound with a focus on tight first-class musicianship, and some slight digressions into something approaching singer-songwriter material on the one hand, and an extended jam on the other. Law is a versatile guitarist, appearing on electric and acoustic guitar. His vocals, while not as polished as some, do have a degree of unpretentious charm, and lyrically, the CD has more to say than others of its stylistic ilk. Scott Law's colleagues in his Group are Australian-born saxophonist Damien Aitken who also played with Law in Hanuman; Dennis Smith on bass, Dave Roda on drums, Chris Haugen on additional guitars including slide and lap steel guitars; plus Melvin Seals and Asher Fulero on keyboards. If there is a kind of jam-band undercurrent to the music, part of that can be explained by the fact that keyboard man Seals and the rhythm section have played with the late Jerry Garcia's band that was a side project from the Grateful Dead. There are also some added backing vocalists, including, Torsheen Daugherty, Jen Bernard and Flora McGill, and some added horn players, such as baritone saxophonist Hans Teuber, who has his own career in the jazz world. With a lineup like that, one might expect this to be a jam-band kind of recording, but instead, the tracks on Deliver tend to be succinct, with most under five minutes, and just one extended piece. The one instrumental is also fairly compact. The songs do provide opportunities for solos by the members of the band, but they are almost all quite brief. The Scott Law Band's debut studio CD Deliver does just that. While all the musical elements that went into this CD have been heard in one form or another previously, Law and his group distill the influences well, and serve it up with first-class musicianship, and a tight, usually danceable rhythmic groove. But they go beyond dance music with their wider range of musical influences and lyrics that in some cases could have come from a folk singer-songwriter. It all adds up to a very likable recording that has more to it than might initially meet the ear, and that rewards closer listening. Our sonic grade is about a "B." The mix has everything in the right proportion, and the rhythm section has a nice punchy sound. But there is excessive volume compression, with the audio level hitting the digital max on practically every beat, and a lot of distortion-inducing audio clipping. Scott Law is one of those many musicians who have been on the scene for close to two decades, toiling away for the most part as a sideman. His new band CD shows us a first-class composer and guitarist leading a great group who take familiar ingredients and make them into spirited, enjoyable music that, in the end does carve out a distinctive sound.